Your divorce may have effects that last a lifetime. Keeping that in mind, the team at The Law Office of Monica S. McElyea, LLC, in Breckenridge, Colorado, devotes one-on-one attention to every case. Ms. McElyea has been practicing law for more than 20 years, and understands that the decisions you make now have both immediate and long-term effects on not only you, but also on the people in your life. The relationship you have with your children may be impacted by the outcome of your custody agreement. Your financial health may be at risk, too, depending on the results of your property division battle, or child or spousal support order. Ms. McElyea begins your case with a free initial consultation at her law office. During that time, she gives you an honest opinion on what you should do in order to move forward with confidence, whether it may be to seek resolution outside the courtroom or through litigation. One of the most important steps to take when facing a DUI charge or criminal conviction is to learn what your rights are and how best to defend them. 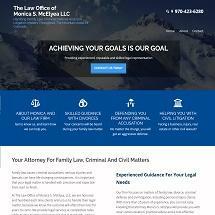 The Law Office of Monica S. McElyea, LLC, represents people in Frisco and Dillon, and throughout Summit County. For your convenience, the practice accepts credit cards.